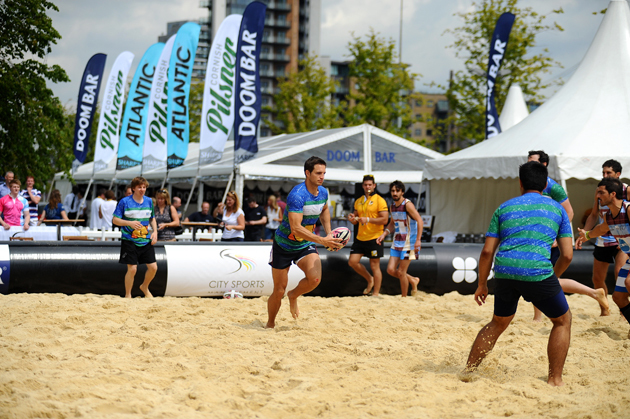 Whether you want to be part of the ruck or prefer to ‘prop’ up the bar, London Beach Rugby is an event not to be missed this summer. Now in its third year, this year’s event is being held on Friday 31 July and Saturday 1 August in Finsbury Square, London. Day one of the event sees corporate rivals going head-to-head, with teams including EY, Clifford Chance and JLL aiming to be crowned City champions. On the Saturday the party really kicks off as ambitious amateur teams take to the sand. Veteran clubs and new hopefuls will dive, dart and sprint across the pitches. Sharps Brewery Doom Bar ambassador Phil Vickery and his hand-picked side will also be showcasing their tricks in a bid to triumph. If you’d rather be sitting in the front row than playing in it, outdoor sport and sunshine is the perfect excuse to come and enjoy the match-day atmosphere. It’s free to watch the games, while the Beach Bar and DJ will make sure nobody swings low when the rugby action stops. Over the two days, London Beach Rugby hopes to raise a huge amount of money for chosen charity Help for Heroes. Admission is free so charitable donations are appreciated to further this worthy cause. Not only will Sharps Doom Bar be on hand to cool things down but partners CityJet, hydration brand CocoPro, apparel supplier BLK and Rugby Radio are all proud to be involved in this prestigious event. It’s not too late to register your team – click here for full details on how to get involved – and all the information about the tournament is below. Where: Finsbury Square, EC2. The nearest tube is Moorgate. Tickets: Admission is free for all spectators but a charitable donation to partner Help for Heroes would be appreciated.